Premier League side Leicester City have confirmed that chairman Vichai Srivaddhanaprabha was one of the five people to have lost their lives in a tragic helicopter crash that occurred just hours after the Foxes’ draw with West Ham on Saturday. The former Premier League winners published a statement on the club’s website and social media pages, confirming the tragic news regarding their chairman’s untimely passing. The statement from the club also notes that their League Cup tie against Southampton on Tuesday, as well as their Development Squad’s fixture against Feyenoord in the Premier League International Cup, have both been postponed following the news. The club also confirmed that the four people who were on board with Srivaddhanaprabha also sadly passed away, with the BBC reporting them as being two members of Srivaddhanaprabha’s staff, Nursara Suknamai and Kaveporn Punpare, and pilot Eric Swaffer and his partner Izabela Roza Lechowicz. 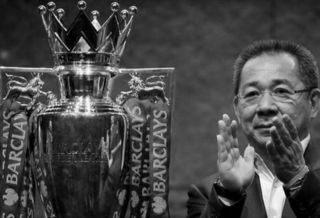 Srivaddhanaprabha was Leicester City’s club chairman during their remarkable 2015/16 Premier League title-winning season, and he will forever be remembered by the club and their fans for his impact on the greatest campaign in the club’s history. Srivaddhanaprabha also oversaw the club’s first ever foray into the Champions League in the following season, a journey that were sure all Foxes can’t thank him enough for helping happen. The 60-year-old became club chairman back in 2011, and his impact on the club is one that we’re sure Leicester won’t be forgetting any time soon, especially following this news. We here at CaughtOffside send our condolences to Leicester City, all of those involved with Srivaddhanaprabha and the families of both him and of those that died during the crash.